Commerical Patio Furniture, Perfect in any setting!!! Many restaurants, bars, resorts and country clubs, regardless of the size of their outdoor area, are turning their outdoor spaces into profit centers with commercial patio furniture. By using materials such as cast aluminum for tables and chairs, the aluminum can be morphed into many different shapes and sizes and give an endless amount of desired looks. Once you have found the shape that you like, innovations in paint technology have allowed the manufacturers to offer their products in a variety of frame finishes. These powder coat technologies have also created a product that handles the natural elements such as sunlight and rain much better. In turn, the products have a longer life as long as they are maintained properly. Depending on the theme of your restaurant, you will need to do some minor maintenance to keep your pieces of cast aluminum commercial patio furniture in good condition. Upon inspection of the outdoor patio furniture you will want to address any cracking or pitting that you may find by simply touching up the piece. No re-painting these areas, the aluminum will never rust. Commercial patio furniture that is made of cast aluminum is heavier than a lot of other products from other manufacturers. It is preferred in parts of the country that are used to high winds due to its weight. With this being said, it is still light enough for your staff to move around to set-up for different events or if it needs to be stored on a nightly basis. Commercial patio furniture includes tables, chairs, bar stools and other items such as baker’s racks. 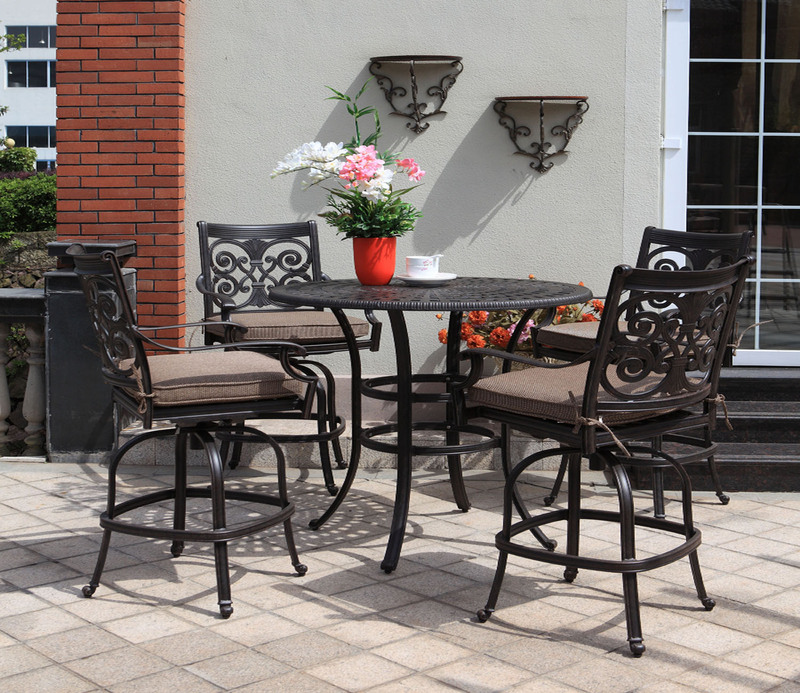 Restaurant patio furniture will come in different heights as well as tabletop shapes. Tables are available in round, square and rectangular shapes. In addition the tabletop itself can be solid or made of a woven pattern referred to as mesh. You can order a standard woven pattern or a basket weave pattern, both will give you the desired look and durability. Commercial patio furniture chairs can be anything that you can imagine. The chairs can be created in any style such as modern, contemporary or a classic style. With the cast aluminum being easy to manipulate, these chairs can be very detailed with individual designs or theme, your chair may have a solid back and the logo of your restaurant, country club or resort stamped in the chair. As an outdoor bar can create many memories for your patrons, you can use commercial patio bar stools to give your facility just the right look and feel that you want your customers to get while at your facility. Commercial outdoor bar stools can be made to give more of a cozy romantic feel or if you run a sports bar more of a fun feel! At a sports bar you could change out the cushions to match the local sports team’s colors depending on what is in-season. As you have learned by reading this article, the possibilities are endless when it comes to commercial patio furniture. You can create any mood or theme that you would like and turn that dead outside area in to a profit center for you. this week, probably give it a try this weekend.